Racin’ Today » Flat Spot On: What Is Future of Brian France at NASCAR? Flat Spot On: What Is Future of Brian France at NASCAR? If we haven’t already seen the end of the Brian France era in NASCAR, perhaps it should be under consideration. The timing of France’s arrest Sunday night for driving with twice the legal limit of alcohol in his blood along with oxycodone in his car could not have been worse. With the recent inaugural victory by Erik Jones at Daytona – NASCAR’s hallowed ground built by the France family – and Chase Elliott’s first career Cup victory at Watkins Glen on Sunday, the sanctioning body has turned an important corner. Two more of the much-needed new generation of driving stars has gotten out of the post-race parking lot and into Victory Lane. And there was France on the other end of New York state in the millionaire’s district of Long Island on Sunday getting himself arrested for sloppy, inebriated driving. How the NASCAR haters, the stick-and-ball devotees who insist racing isn’t an athletic endeavor, must have celebrated. Another important corner now looms as NASCAR can look at an option of installing different leadership in the CEO’s seat vacated by France under the leave of absence he announced Monday night. Brian France deserves much credit for achieving important breakthroughs since taking over the helm from his father Bill France Jr. in 2003. The playoffs system, credited to his son by France Jr., and the current stage racing took place on his watch. Both were controversial, but much needed. There’s also been two new generations of cars and not a single death in NASCAR’s three major traveling series, which can’t be said by the world’s other major series. 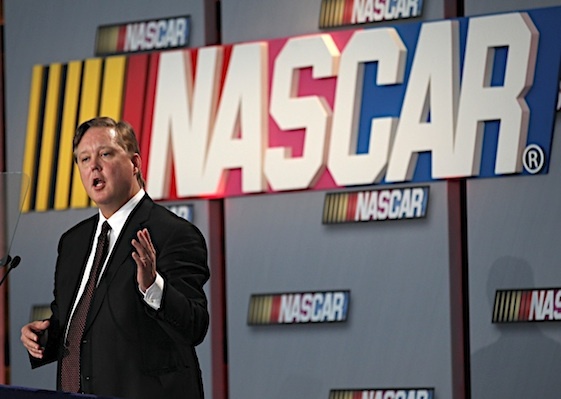 Brian France led the current diversity movement, which positioned NASCAR for the future even while alienating some fans in the present. Darrell “Bubba” Wallace, the sport’s first black driver since Bill Lester and the first full-time black driver since Wendell Scott, is competing for this year’s rookie title with Richard Petty Motorsports. Hispanic driver Daniel Suarez, himself showing signs of winning, is in his second year of Cup competition at Joe Gibbs Racing. So, more’s the pity when it comes to bad timing for the now tainted NASCAR leader. Some might say, to paraphrase Charlotte Motor Speedway’s longtime promoter Humpy Wheeler, that Brian tried to make NASCAR more like a violin and less like a fiddle, leaving the sport’s deep roots behind. Maybe it was necessary to move to the American cultural center. But the third-generation France has long since failed to persuade people that he is more interested in racing than seeing NASCAR as a lucrative marketing project. This seeming lack of passion for the sport stands in sharp contrast to his grandfather, NASCAR founder “Big Bill” France and his father France, Jr.
Bill France Sr. was not a fan of gambling when it came to NASCAR. The Roberts court is. 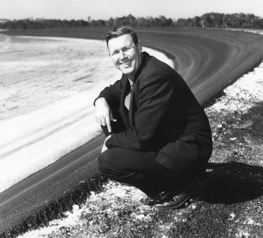 the sands of Daytona across the nation and the visionary who defeated other would-be stock car promoters when he built the Daytona International Speedway. Until his later years, you could find him in his office by appointment or at the track, ready to talk about NASCAR and racing. France Jr. sustained that dedication. Not long after succeeding “Big Bill”, France Jr. set up a folding chair at the end of the pit road at the Darlington Raceway, straddling it, smoking a cigarette and facing oncoming drivers as they exited the pit road. If they wanted to run him over, they had their chance – otherwise there wasn’t any question of who had the guts to be in charge. Another prevailing memory is France Jr. walking gingerly through the garage at the Sonoma Raceway while recovering from two bad ankles, severely broken in a boating accident. He could barely walk, but he was available in the garage for anybody who wanted to talk to him while keeping himself up to speed on what was happening in the sport he directed. For this writer, the enduring memory of France Jr. was his fight with cancer, including chemotherapy and radiation, to make sure he left the sport on his own terms. As it turned out, France Jr. lived long enough to direct NASCAR’s transition into the best racing safety organization in the world after Dale Earnhardt Sr.’s fatal crash as well as lay the groundwork for the arrival of Toyota in the Cup series. Maybe Brian France was in a better position to withstand the slings and arrows from those who disagreed with his breaks in tradition by not being such a creature of the sport. There’s another viewpoint that, if accurate, means a change should be considered. Perhaps Brian France’s vision for the future of a diverse NASCAR has been more focused on everybody’s money is green – including a huge infusion of cash from Toyota. He has also presided over bringing people into the sanctioning body who seem to be less enthusiastic about the sport than their own marketing careers. France’s own eternal absence from the garage – last weekend choosing a posh summering spot instead – may not necessarily confirm a relative lack of interest in racing. But how else to explain it? About the only other spin is sheer arrogance. As a journalist, I’ve known and worked with all three generations of the France family, including Jim France, who will take over as the interim CEO, and Lesa France Kennedy, the CEO of the International Speedway Corporation that owns 12 tracks hosting NASCAR events. The younger brother by ten years of Bill France Jr., Jim France has been a lifelong fan of motorcycle racing and road racing in addition to his behind-the-scenes role at NASCAR. He stepped into the limelight in 1999 by launching and directing the Grand-Am Series, which has evolved into the IMSA WeatherTech SportsCar Championship, a road racing powerhouse. The successful acquisition of the rival American Le Mans Series and IMSA demonstrated Jim’s savvy corporate leadership. 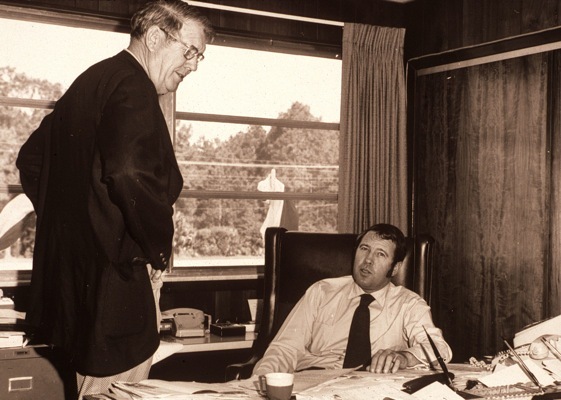 And, his tenure has included frequent appearances at the tracks, using the Newell Coach he bought from the estate of the late John Bishop, who co-founded IMSA along with “Big Bill” France. Although he has sometimes roved the Daytona track incognito aboard a motorcycle with helmet in place, Jim France regularly rubs shoulders with drivers, crew members, fans or journalists at IMSA events. He has dropped the “drapeau” at the Le Mans 24-hour. He is a racer’s racer in many respects. As such, one can expect a different type of leadership from him in the days, weeks and months ahead, although it can be anticipated that he’ll rule in the France family tradition of low key and hard-nosed. Since taking over the track holdings of the family business, France Kennedy has been an outstanding performer, despite the tragic loss of her husband Bruce in a private plane crash in 2007 and the downturn in NASCAR fortunes. Her vision includes the makeover of the Daytona International Speedway as a model for much needed track conversions in the future. She avidly supported the racing career of her son Ben, the winner of a Camping World Truck Series race. In the short run, NASCAR needs to make some dramatic changes to stop the slide in TV ratings and attendance in the Monster Energy NASCAR Cup Series. 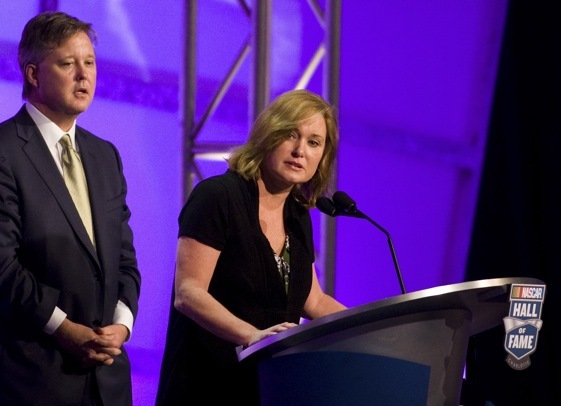 Given their track records, experience and love of racing, I would not be surprised to see Jim France and Lesa France Kennedy generate a much-needed new vision for the sport. The recent mooting of a sale of NASCAR, which would be radical, obviously had to have the blessing of Jim and Lesa as the major stockholders. But this appears to be an age-old France family tradition of writing down on a yellow legal pad all sorts of blue sky options. The most likely goal in this scenario would be identifying a major media company willing to buy a minority stake and take up a new TV contract out of long term self-interest. Such a sale – or a sale to other parties — remains a possibility. But I doubt the Frances believe they can succeed with the family’s track holdings after turning over the majority ownership of NASCAR to someone else. Short term, the ongoing difficulty with meat-and-potato issues like series sponsorship and the looming need for a new TV contract could be a contributing factor to an executive having a difficult time coping with his circumstances. That same executive may now be a stumbling block in these negotiations. Brian France has chartered difficult waters in moving NASCAR forward. But given the current outstanding problems faced by the sanctioning body, his return to a leadership role may not be the best option. I must say it amuses me when I read that the ‘chase, playoff, and stage racing’ have been great ‘innovations’ for Nascar. If that’s the case, why are attendance and ratings still going downhill? It certainly doesn’t seem that just because it’s different that it has bee successful. By what standard? Major sponsors are leaving the sport, team numbers are down, and tracks are removing seats big time. Where is the success of these drastic moves showing up?